Please excuse the lack of blogging for the last week or so. My Mac went on the fritz! I had to send it in to have it fixed. All is well again. In the meantime, we had a working fourth of July week/weekend. Esther spent the entire week in Lynden, working with her brothers and sister-in-laws, sorting through everything in her parent's home. There were at least three generations worth of collected stuff. Some of it had some value as antiques, some of it was just junk. But Esther and her brothers are quite sentimental, so every piece needed to be reviewed and items distributed amongst them. 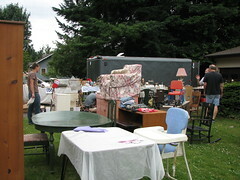 We worked hard on the fourth, preparing for the garage sale/antique sale on Saturday. The sale went OK, with lots of customers. The remains went off to Value Village. what?????????? I thought macs never went on the fritz!!! !